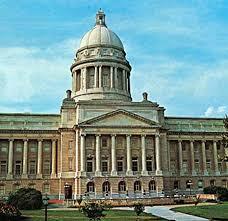 It is no accident that God has planted us in the capitol of the Commonwealth of Kentucky. Influential representatives from across the state regularly gather in our city to handle the affairs of the state. Kentucky Baptists care deeply about our political leaders and have a ministry in place to connect with them. Steve Weaver, pastor of Farmdale Baptist church, serves as a non-partisan chaplain through to Capitol Commission to Kentucky’s elected officials and their staffs. He leads a weekly bi-weekly Bible study that each capitol employee is invited to attend and receive a meal. Resources, including Bibles, are readily available for staffers that have an interest in learning more about spiritual things. In 1 Timothy 2, Paul exhorts believers to faithfully pray their political leaders. Dr. Weaver regularly tweets a list of officials to pray for. This non-partisan ministry has mobilized a prayer force and God is answering these prayers. Through the relationships developed through the weekly lunches, Dr. Weaver is gaining more and more of a platform to proclaim the Good News of our Savior within the walls of the Capitol annex. How can I pray for Steve Weaver and the Capitol Commission? Pray that Dr. Weaver’s will continue to grow within the leaders and staffers at the capitol. Pray regularly for Kentucky’s political leaders (including those you don’t agree with). How can I support the Steve Weaver and the Capitol Commission? You can donate here to cover meal and resource expenses. How can I contact Steve Weaver and the Capitol Commission?